As part of the Ban Tai Estate, Villa Frangipani is a new five bedroom villa that brings together functionality and style in its design, complemented by a plethora of services from spa treatments to an on-call concierge, that makes for a fun and enjoyable experience for you, your family, and friends. With Ban Tai Beach just a few minutes away, this will be a vacation to talk about for years to come. There are five clean, modern, and stylish bedrooms in Villa Mojito. Each bedroom has a king size bed with an orthopedic mattress, which ensures that you get a really restful night’s sleep. Each bedroom also leads out onto a private terrace where you can sit down and enjoy the view of the surroundings when you wake up each morning. Every bedroom also has an en suite bathroom that is clean and functional. 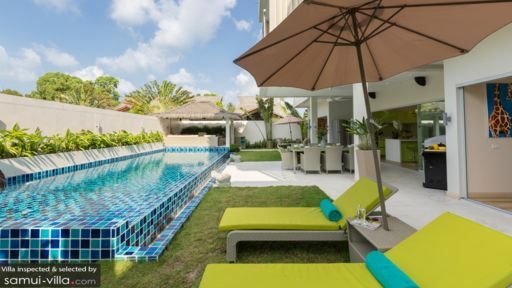 While Ban Tai Beach is not too far away, the villa also has a relaxing outdoor space of its own. Guests can take a morning or afternoon swim in the 14 meter blue tiled pool. For guests with kids, you don’t have to worry, the pool also has a shallow area where they can spend time in. Two sun loungers by the poolside are also available for those who want to take some snacks before swimming again or simply lay back and relax. On the top floor is a roof-top covered terrace. In the evenings, you can relax on one of the large pod shaped loungers and enjoy a movie while munching on some freshly cooked popcorn. The view of the trees and a mountain range from one area of the terrace is a delightful bonus to an already enticing space. 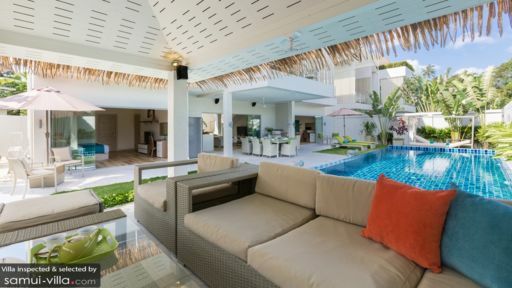 Villa Mojito not only has comfortable sleeping quarters but its also has stylish and comfortable living areas as well. While the living area and the fully equipped kitchen are in the same space, separated only by a breakfast countertop, the space maintains a light and airy quality. In the living area, guests can kick back and on the sofa and watch TV. Fun afternoons with family can also be spent cooking together in the fully equipped bright kitchen. You can take your meals in the covered 12-seater outdoor dining area, that is fan cooled, where you can also enjoy the garden area and the breeze. The staff here at Villa Mojito are determined to make your stay hassle-free, enjoyable, and memorable. The villa comes with a variety of services such as a concierge service, where they will be ready to help you with your itinerary, room service, a babysitting service, as well as an option for a private in-villa chef. The staff here at Villa Mojito will strive to meet your every need. 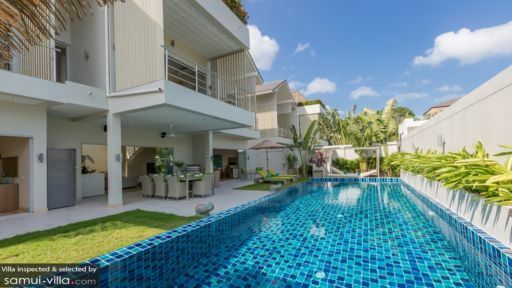 Part of the Ban Tai Estate in the island of Samui, Villa Mojito is perfectly located for a fun beach getaway with family. On the estate is Ban Tai Beach and Ban Tai Pond. A trip to Ang Thong National Marine Park, with its various natural beauties such as caves and hiking trails, can be arranged. There are a variety of restaurants, beach clubs, and night clubs on the island of Samui as well. The villa offers guests the option of a car for hire if they want to explore the area more.